You'll never be stuck for words again with this translation software installed on your computer. It's like having a multilingual assistant at your side at all times, instantly translating sentences, words, phrases and segments of text – regardless of what application you happen to be using. Whether you need a translator for business, school, language studies, or personal use, the Translation Assistant is an intuitive program that's incredibly easy to use. Once installed, the Translation Assistant sits quietly on your systems tray, waiting to go to work. When you encounter a word or snippet of text you need translated, simply select that text and click on the translation software icon. Choose which of the seven language pairs you want the program to use and it will display both your selected text and the translated version. If a word has more than one possible meaning, the Translation Assistant can even provide alternate interpretations. 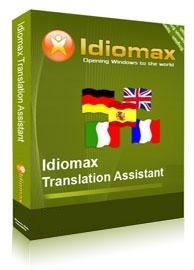 This IdiomaX translation software is always there to help you, no matter what application you happen to be using: chat, e-mail, blogs, websites, etc. It's your multipurpose, multilingual 24/7 translator. Provides a quick translation of selected text, sentence, phrase or word in language of your choice. Seven language pairs, including popular English to Spanish translation and Spanish to English translation (see list below). Offers ability to search alternate meanings of words and phrases.